CINCINNATI -- Jake Arrieta did not throw a perfect game against the Reds Thursday night. But it was a perfectly miserable night for the home team. Arrieta no-hit the Reds in a 16-0 Chicago Cubs’ victory at Great American Ball Park. He walked three, struck out six and needed no Web Gems to pitch his second career no-hitter. His first came last Aug. 30 at Dodger Stadium, beating Los Angeles 2-0. That gem came as Arrieta put together one of the best pitching stretches in club history. Hey @Reds , Arrieta no-hitter support group meets on Mondays. To get no-hit is one thing. To get no-hit and beat 16-0 is another. “It’s miserable,” Reds manager Bryan Price said. “Guys will tell you the same. As good as Arrieta was tonight, nobody wants to be embarrassed. Nobody wants to be no-hit. Nobody wants to be part of giving up 16 runs. “We got dominated,” Jay Bruce said. “That’s the most lopsided baseball game I’ve ever been a part of. Obviously, the no-hitter and all the runs they scored is talking point. But at the end of the day, it’s a loss. You’ve got to forget about it. 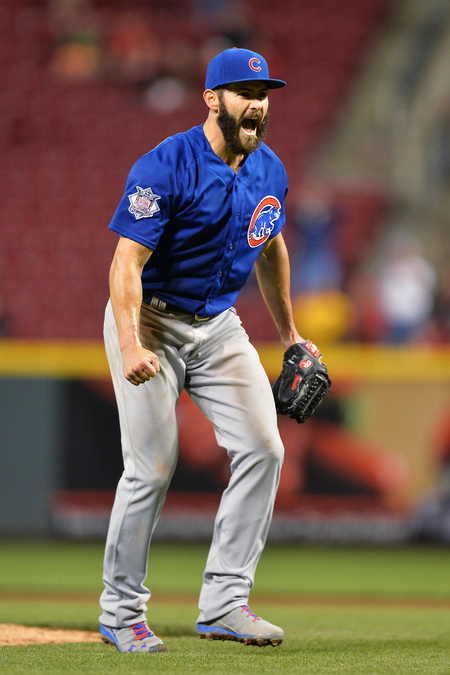 Arrieta, the reigning National League Cy Young winner, has been on an incredible roll. It was his 24th consecutive quality starter, the long streak of QSs since Bob Gibson went 26 starts. Arrieta was matter-of-fact afterward. He seemed happier that David Ross, the former Red in his final year, caught his first no-hitter. “To me, that’s why this is so special,” Arrieta said. He looked beatable early. He walked two in the first four innings and gave up some hard-hit balls. 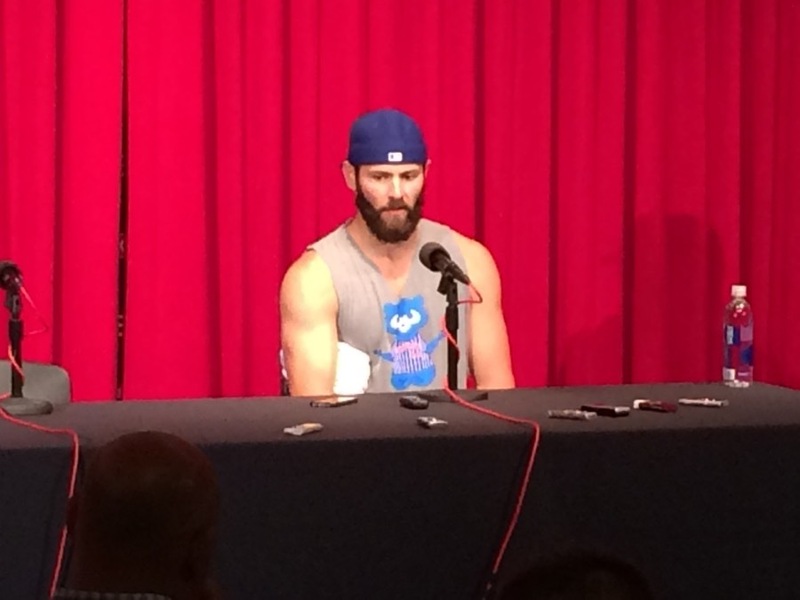 Arrieta talks to media at Great American Ball Park about pitching his second career no-hit game. Arrieta’s pitch count caught the attention of both managers. Cub manager Joe Maddon was going to let Arrieta go as long as he had a no-hitter, despite the pitch count, but he was concerned. After a nine-pitch seventh and a nine-pitch eighth, Arrieta had his pitch count under control. He walked Scott Schebler on a 3-2 pitch to start the ninth. Pinch-hitter Tucker Barnhart skied out to shortstop. Zack Cozart hit a line drive to center that hung up long enough for Dexter Fowler to catch. Eugenio Suarez flied to right to end it. The Reds had not been no-hit in the regular season in 7,109 games — the longest streak in the majors. Rick Wise of the Philadelphia Phillies did it on June 23, 1971. #Reds have not been no-hit in 7,109 regular-season games. Longest streak in the majors. The Reds were no-hit Oct. 10, 2010 by Roy Halladay in the National League Division Series in Philadelphia. The Cubs previously had the longest regular-season streak. Cole Hamels of Phillies ended their streak of 7,920 with a no-hitter Sept. 9 of last year. That was the longest streak of consecutive regular season games without being the victim of a no-hitter for any team in modern big league history. The Reds had been one-hit 33 times in the regular season since Wise’s no-no... most recently by -- you guessed it -- Arrieta. Brandon Phillips doubled in the seventh inning to break that one up. The Reds hit some balls hard against Arrieta on Thursday. Kris Bryant made a nice stop and long throw to get Cozart in the third. Anthony Rizzo made a diving stop on a ball Joey Votto hit in the fourth. But it didn’t take any Web Gems to preserve it and make it a perfectly miserable night for the Reds. The Cubs have won their last five games in Cincinnati, the first time they've done that since the 1972-73 seasons. Reds: CF Billy Hamilton was out of the lineup with a sore left thumb, injured when he hit his glove while trying for a catch in St. Louis last weekend. He aggravated it on Wednesday and will be sidelined a couple of days. ... RHP Alfredo Simon is still expected to start on Sunday against the Cubs. He had to miss his last scheduled start because of biceps tendinitis and got an injection of anti-inflammatories. Cubs: LH Jon Lester (1-1) is 1-0 in five career starts against the Reds with a 3.82 ERA. Reds: Jon Moscot (0-0) makes his second start. He came off the DL on Sunday and received no decision in a 4-3 loss at St. Louis, giving up six hits and three runs in 5 2/3 innings.